Is Your Internal Communications Strategy Sick? Check Your Symptoms. From corporate announcements to employee engagement, a lot of responsibility falls on the proverbial shoulders of an organization's internal communications strategy. It's the cornerstone of any successful business – and it's something that many businesses continue to struggle with. Improving and streamlining communication can be time-consuming and frustrating without the right strategy and tools in place. Unfortunately, 51% of organizations agree that there is no long-term strategy for their internal communications, according to the global 2016 State of the Sector study from Gatehouse. In that same study, only 49% of respondents said they had a written annual communication plan; and only 37% had a written strategy covering over a year, or a written value proposition for internal communications. Without a solid strategy and effective tools, all of those critical activities suffer. With the right strategy and the right tools, internal communications drive innovation, improve employee engagement and increase productivity. One problem we see time and time again is that many businesses are still relying on email for day-to-day communication and to get important messages out. Though email is a powerful tool, it can become yet another roadblock if it's the main tool that gets used for internal communications. People simply receive too many emails today. Important messages get lost in overstuffed inboxes – and employees are too busy performing their jobs to try to sort through it all, then find and read vital communications. The good news is this: There are better tools available today than email. Tools that make internal communications easier and more effective, and can bring a sick communications strategy back to full health. Having a healthy internal communication strategy is critical to business success. A healthy strategy is proactive, intentional, and uses the tools and processes that most effectively reach the intended recipients. 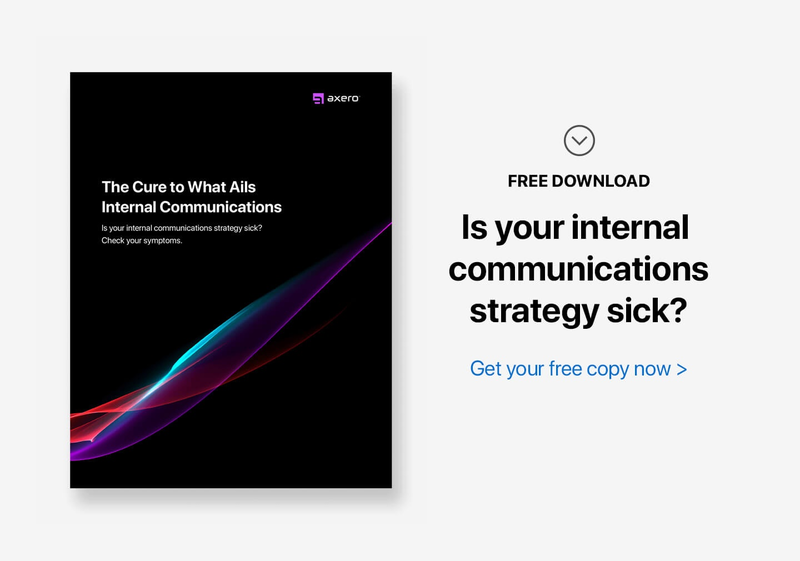 Read on to learn the symptoms of an ailing internal communications strategy, and discover the "treatments" that will get your strategy on-track and thriving. Innovation is the heart and soul of a successful business. When employees are motivated and inspired, they become fountains of ideas that improve processes, create better customer experiences and drive your company forward. When your internal communications strategy is healthy, it's easy to reach employees with messages that motivate – and it's easy for employees to respond with their great ideas. Employees feel energized about their roles and committed to the company, and they churn out better ideas and solutions that lead to the creation of new products and services. Many organizations actually impede innovation by not making it easy for employees to share ideas, exchange information or ask questions. Not implementing solutions for feedback and collaboration can put a damper on brainstorming and halt conversation around new concepts. Not only is this discouraging to employees, it can have a serious impact on employee engagement and turnover. Think about this: 75% of people think they're not living up to their creative potential. In the U.S. and the UK, 80% of people feel increasing pressure to be productive rather than creative. That's a lot of pent up creativity and unrealized innovation! Simply encouraging employees to come up with new ideas and giving them the tools to share those ideas could go a long way toward quickening the slow pulse of innovation. When innovation slows and ideas dry up, this may be a symptom of failing internal communications systems. If all three types of communication aren't enabled and healthy, a gap occurs. Within that gap festers stagnation and employee disengagement. It's where innovation goes to die. Great ideas come from great communication. Open, online discussion forums bring everyone together and enable all three types of communication within a company. They streamline information sharing, improving knowledge dissemination and encouraging idea contribution. Most importantly, discussion forums make leadership more accessible to employees. Employees become more willing to share their ideas because they know their ideas are being heard by decision-makers. End result: An influx of fresh ideas from employees – and thriving innovation. The secret sauce of a can-do culture is employee morale. When employees are feeling positive about their place in the company, they are more engaged and productive. But keeping morale high requires effort. When you have remote employees or multiple offices, isolation can occur and quickly sap that sensitive morale. Changes within the company – which are constant in today's business environment – can also decrease morale. Especially if the only updates employees are receiving are coming via the rumor mill. Consistent and high-value internal communication is the key to keeping employees' chins up, no matter what is happening within your organization. Helping executive leadership communicate directly with employees, and not relying solely on message cascades, can make a big difference, too. In the listening phase, activities such as employee surveys, discussion groups and focus groups are important. In the communication phase, electronic media becomes more important, as do forums with broader audiences. In the recognition phase, public recognition is the top priority. But none of this can happen without an internal communications strategy and tools to support it. When employees aren't interacting as much and your change management processes are ineffective, these may be symptoms of a failing internal communications strategy. Keeping employees in the loop while rousing their motivation and guiding them through change is no easy task. In fact, only 42% of employees know their employer's vision, mission and values. That's a scary statistic, but it illustrates how easily employees can become disconnected from the company. Employee morale isn't just important for your organization – it's critical to the health of your entire company. When morale begins to pale, you must take action quickly. Social media interrupts workers every 10.5 minutes, and 60% of people are visiting social media sites during working hours. Social media has become a part of our everyday lives – and a common way to share information. Tap into this and use it to improve employee morale by creating a social intranet. A social intranet helps you bring essential information together in a centralized location, so no one is left out of the loop. Keep employees up-to-date on company happenings by posting news, updates and announcements in a central portal. Retain important documentation in one place so important information doesn't get buried in email. And make sure employees always have access to motivational collateral that shows them how important they are to the company's bigger picture. A social intranet also helps employees communicate with one another in a familiar way. After all, if they're already spending time on Facebook, they're going to quickly grasp the benefits of commenting on news items, participating in group discussions, and using chat. End result: Employee isolation comes to an end, miscommunication comes to a screeching halt, and crucial information stops disappearing in overcrowded inboxes. When employees know what they're supposed to be doing – and why they're supposed to be doing it – productivity moves along without resistance. Work gets done, assignments get handled and goals get completed. On the other hand, when a team member is unsure of his responsibilities and doesn't know how to prioritize his time, his productivity slows. Those missed deadlines then impact the rest of the team, then the organization, and eventually the company. Gallup research uncovered that only 41% of employees feel that they know what their company stands for and what makes its brand different from its competitors. If an employee doesn't know what a company's role is in the marketplace, how can they really understand what their own role is within the company? Communication problems are often the culprit, here. When information sharing doesn't happen in the right way or at the right time, productivity is impacted. Tasks go uncompleted due to lack of direction or missing information. Misunderstandings happen. Goals get missed. Clear communication helps employees understand the company they're working for and their own roles. It shows people where they are, where they should be in the future, and a path to get there. Uncertainty is lifted. Misunderstandings are over. Of course, poor task management and lack of organization also restrict productivity. These things both contribute to losing track of important responsibilities and dates – and they're both solvable with good communication and the right tools. Many companies think they're providing their employees with all the right tools, when in fact they're just causing more confusion. The right tools should work together. Having one app for your calendar, another for task management, another for chat, another for project management, and so on – well, that's a recipe for chaos. Having one tool that does it all, however – that's a recipe for productivity. When deadlines are getting missed, tasks are going undone and productivity seems to be stuck in a rut, you may be suffering from poor internal communications and a mess of communications tools. Don't let poor productivity constrict your team's success. Improve internal communication and you'll improve everyone's productivity. First and foremost, make sure that each team member's role is clearly defined and documented. Then, centralize that documentation using an intranet solution. That way everyone has access to the information they need to do their jobs. Also, make sure your team has the task management and scheduling tools they need to operate at peak efficiency. A solution with private and shared calendars, like Communifire, will make sure your employees never miss a date or a deadline. Private calendars can contain personal reminders, while team-related meetings and events reside on a public-facing calendar that is shared with the team for easy scheduling. End result: A work environment that fosters productivity. No matter how awesome your project management system is, one little miscommunication can derail an entire project. It happens all too often, especially with the information overload that almost everyone experiences today. Sometimes course-correcting means just taking a few steps back – but sometimes you have to start all over again, from scratch. No matter how it turns out, stuttering progress and unforeseen roadblocks are frustrating for everyone involved. Fewer than 1/3 of all projects were successfully completed on time and on budget over the past year. Pricewaterhouse Coopers found that the use of commercially available project management software increases performance and satisfaction – yet 44% of project managers use no software. High-performing organizations successfully complete 89% of their projects – and low performers complete only 36%. Conversely, all of these things can be negatively affected when internal communication processes are weak. Many project teams focus so much on communicating with stakeholders, they forget that communicating with each other is critical to the success of the project. There are two pieces to successful internal team communications: planning and tools. Without a plan outlining communication objectives, responsibilities and activities, information gets lost. Without the right tools for communicating with one another, communication becomes difficult and people quickly get discouraged. Sometimes, however, projects get blocked because of technical glitches. You guessed it: Communications problems are often the underlying issue here, too. Many teams don't have a solid process for logging issues, getting them assigned to the right technical resources, or monitoring the progress of fixes. If your projects are getting off-track due to miscommunication, faulty internal communications systems might be the culprit. And if technical glitches are the problem, lack of an issue tracking process might be the underlying cause. Stop relying on email, phone calls and in-person meetings to communicate critical project details. There are better ways to manage internal communication and keep projects on track. Project teams need effective internal communications tools to collaborate and keep projects running smoothly. Intranet-enabled team chat, private messaging and group messaging tools keep important messages and conversations out of cluttered inboxes. These powerhouse communication tools also help individual team members keep tabs on their progress and make key project details readily available – no matter their location. Collaborative spaces with chat and messaging keep teams working together and empower individuals to do their part. They can also be used to share files, search for contacts and locate past conversations. But what if the project is stalled by a technical glitch? An intranet solution can help overcome that as well. Create a case, ticketing, and issue tracking space so project team members can log technical issues as they arise. Rather than sending an email to a support team and waiting around for a response, a support tool like this enables the internal customer to keep an eye on the progress of the fix. They can also update the ticket if new information arises, helping the support team to solve the problem faster. End result: Projects run more smoothly and without costly miscommunications. It's no surprise that companies with more engaged employees outperform their competition. Employees that care about their role within the company are more invested in doing a good job and even growing their careers. Internal communication at all three levels (top-down, employee feedback, and team conversation) is a good indication of employee engagement. What many companies forget, however, is that communications also promote engagement. The easier you make it for people within your organization to talk to each other, the better your employee engagement. But the same goes for getting corporate and leadership messages to your employees. Delivering company information and leadership messages to the organization in a way that's easy to access and absorb can make a huge difference in employee engagement. Vice versa, the more difficult it is for employees to communicate and obtain company information, the more their commitment to the company erodes. And there's little more frustrating than dealing with employees who are disengaged from their work. Chew on this: Only 27% of organizations believe that employees have a good understanding of why leaders make their decisions, according to that Gatehouse 2016 SOTS report. Maybe you're not purposefully keeping employees in the dark – but giving leadership the tools to more thoroughly explain their thought processes can only help. It's great when leadership announces big-picture visions. This helps paint a picture for the organization and gives them a broad goal to aim for. It can even be motivational … initially. But to really bring that vision to life, and especially to help employees understand what it means within the context of their daily work-lives, leadership needs to be able to explain the details. Then, to keep the dialogue going, employees need to be able to respond. All of this requires the right communications tools – and email alone won't cut it. That same Gatehouse report found that the number one barrier to successful internal communication is lack of line manager communication skills (59%). So making sure that you have the right communications tools in place is only the start. You also need to make sure that leaders know how to use them effectively. If employee engagement begins to flag, this may be a symptom of internal communications issues. Whether corporate communications or employee-to-employee communications, the right tools can make all the difference. Too many organizations still rely on lengthy, text-heavy emails when communicating internally. While this may get the information out, that information is not easily absorbed by the people you want to read it. Not to mention, these emails often get lost in overcrowded inboxes. To make corporate messages engaging, consider creating a video. Employees are more likely to grasp concepts and remember them in this format – and it's easier to absorb the message in a video than in a long block of text. A whopping 93% of internal communications professionals believe video has become essential to getting messages out. Then simply upload the video to your intranet and post an update to the space or group you want to get the message. End result: More informed employees who are also more engaged. What's the one simple solution to all of this? What is the one tool that can offer all of the "treatments" suggested here? An internal communications hub, aka an intranet. An intranet is a central, searchable hub for your teams, conversations and documents. It is a communications enabler, an employee engagement driver and a productivity booster. It's the one tool that every company can use to improve the health of their internal communications. Why Your Company Needs an Intranet. How to Build an Intranet. Good internal communications keep your business afloat. Great internal communications drive innovation, improve employee engagement and increase productivity. On the flip side, poor internal communications cost businesses an average of $26,041 per employee per year in lost efficiency. Ready to use internal communications to your advantage? Follow these five tips to take your internal communications from good to great. If you're still relying on email for all of your internal communications, you're missing out on a huge opportunity. Not only are important messages likely getting lost in overcrowded inboxes, but emails from leadership can feel awfully one-sided to employees. Use tools such as discussion forums and business social networking to get the word out in a way that's easy for employees to engage with and respond to. When you make it easy to interact with leadership, employees are more likely to feel like their voices are being heard. Use tools such as real-time chat and private messaging to help employees communicate with one another, too. These tools keep the conversation going without the risk of email overload, and help everyone feel more connected. It's a good thing for leadership to communicate with employees through written messages and updates. This helps employees understand what's going on at the company, and when done right it can help employees see how their work impacts the bigger company picture. Leadership messages have the power to engage employees, and truly make them feel connected to the company and their roles. Unfortunately, many of these messages read like form letters. While they may communicate vital information, they don't do much for the relationship between leadership and employees. And these communications certainly don't encourage employees to communicate back. Encourage your leadership team to be a little more personal in their communication to employees. Then, make sure those communications are accessible in a centralized location, such as the organization's intranet page. Change is inevitable in today's business landscape. But that fact doesn't make employees feel any better when their jobs may be on the line. There is a whole methodology behind change management, and transitioning individuals and teams through these challenging times. The foundation for successful change that doesn't kill employee morale, however, has to be communication. Consistent and open communication helps guide organizations through change by making employees more aware of what's happening. Where many businesses go wrong is communicating in one direction – leadership to employee. Keep communication flowing through times of change, but do it in a way that encourages dialogue and prompts employees to reach out with concerns. A company intranet is a great tool for this. We touched on this in #1 above, but it deserves a second mention. Stop sending important messages through email! We all get too many emails every day. It's simply not an efficient or effective tool for company-wide conversations anymore. Every email you send out just adds to the information overload employees are already experiencing. A centralized communication hub like this will also improve document management, idea exchange, technical support, and collaboration. Does everyone on your team know the company's mission, vision and values? You might be surprised at the answer. Only 42% of employees know these things. If not everyone is aware of the direction of the company, how will everyone work toward the same goals? The answer is, they won't. In order to get everyone rowing in the same direction, everyone needs to know the company's goals and objectives – so that information needs to be available in an easy-to-find location. Publishing them online is a great solution. Using an intranet like Communifire, you can also make organizational, team and individual goals readily available for reference. This makes it easy for employees to see how their day-to-day work leads directly to the company's success. Improving internal communications is a smart move. It will empower a more committed and better-performing workforce, make sure everyone is working toward the right goals, and make leadership more effective. A centralized communication hub such as an intranet makes communications easier for everyone.